Carmel Smyth, president of the Canadian Media Guild, met with CJFE Executive Director Tom Henheffer (left) and reporter Ben Makuch to discuss VICE Canada's legal fight with the RCMP. A judge has granted CWA Canada and its coalition partners permission to intervene in the legal fight between VICE Media and the RCMP over a journalist’s right to protect sources. “This is an initial victory,” said President Martin O’Hanlon. “The big battle lies ahead” when the case is heard in February by the Ontario Court of Appeal. 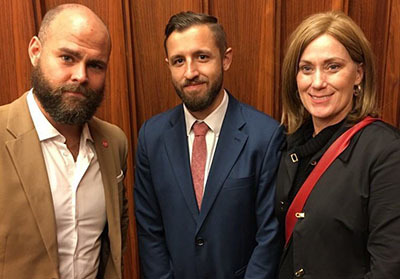 VICE is appealing an Ontario Superior Court ruling that upheld a production order issued by the Mounties against journalist Ben Makuch to hand over all communications between him and an alleged ISIS fighter. The media company has launched protectpressfreedom.ca, a multi-platform campaign to raise awareness about the case. Canadians will be encouraged to sign a petition to Attorney General Jody Wilson-Raybould, Minister of Public Safety Ralph Goodale and RCMP Commissioner Robert Paulson, asking them to drop demands for the release of Makuch’s private material and correspondence with sources. VICE argues the ruling will have a “detrimental chilling effect on the practice of journalism in Canada” by undermining the independence of news outlets and compromising the trust between journalists and their sources. “If the ruling stands,” said O’Hanlon, “it would be bad news for journalism and for democracy. Sources, including whistleblowers, would be far less likely to talk to journalists knowing that they could be tracked down by police. He said that was why CWA Canada and its largest Local, the Canadian Media Guild, which represents VICE employees across the country, joined the coalition to intervene in this case. Others include the CBC, APTN, Canadian Journalists for Free Expression (CJFE), the Canadian Association of Journalists and Reporters Without Borders.